Affordable Grain-free, High-protein Dry Food? Discussion in 'Cat Nutrition' started by smosmosmo, Mar 19, 2019. Smo was fed only dry food (Purina Cat Chow) for the first four years of her life, and eats mostly kibble and a couple ounces of wet food per day. I've been through maybe five different types of dry food and have been having trouble finding a great one that's still well-priced. For the past several months she was eating Purina Pro Plan True Nature in the salmon and egg flavor, but it contains menadione bisulfite and the first four ingredients aren't all meat-based like I'd prefer. It also seems to make her slightly constipated and her bowel movements tend to be dry and irregular on this food. 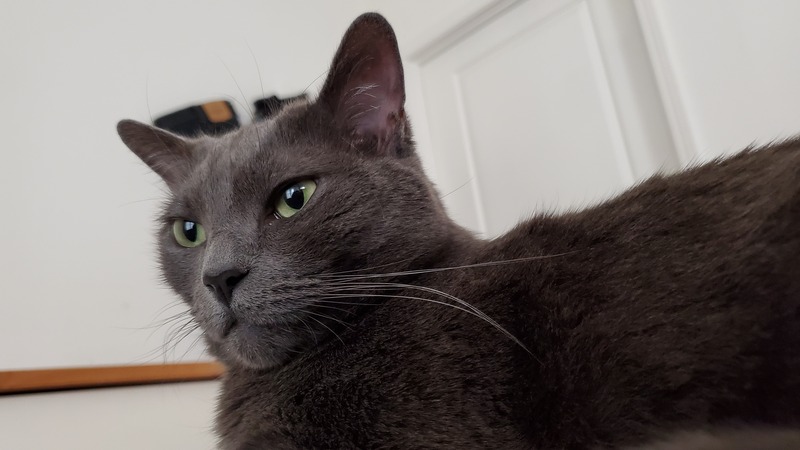 She seemed to be doing well on Nulo's salmon flavored kibble during the few weeks we tried it, but it seemed to be giving her some sort of indigestion - she'd make these odd gasping noises in her sleep that my boyfriend thought was "kitty acid reflux." Funnily enough, it went away when we rotated the Nulo out of her diet. Right now I'm feeding her the bag of Dr Elsey's Cleanprotein salmon we got to try, and she's doing very well on it. Healthy poops and I've noticed her fur has gotten softer and glossier. I'd like to keep feeding her the Cleanprotein but it is very expensive - about $42 for 6 lbs on sale. First four ingredients in this aren't even all-meat like the Nulo - rather it's salmon, chicken, egg and gelatin - so I'm not sure it's worth the cost. I'm not sure what to try next, just looking for something that's under $30-35 for at least a 6 lb bag. We want something fish-flavored that's low-carb with all meat as the first few ingredients. Does anyone have some good recommendations? The highest protein content I see on dry food is 35 - 40%. Crave Adult Dry Cat Food. Thanks for the recommendation! I would love for her to eat wet food only but she is so stubborn...she needs her wet food to be soupy and won't even touch it a quarter of the time. I try to compromise with her by letting her eat dry but making sure she has at least one serving of wet food per day. Gelatin is a product made from bones and connective tissue, and is actually quite a good ingredient, especially as the binder. It's good for joints, skin, and gut health. Even though it's expensive it's very calorie dense which means you need only a small amount a day for most cats. That being said, mine won't eat it LOL. So I feed Wysong Epigen 90, which is $25 for 5 lbs. The company does do samples for $2.50, but they sent me a whole bunch of stuff. smosmosmo and maggiedemi purraised this. I feed mine Taste of the Wild, which has a fish version. Chewy has it for $14.99 for 5 pounds, and $30.99 for 14 pounds. Oops I didn't see the fish part! Wysong Epigen (not 90) does come in a fish flavor and is still high in protein, but some is potato protein and I'm not as excited about the ingredients. Rosepud and smosmosmo purraised this. Thank you both for your suggestions! @mizzely She's been loving the Dr Elsey's so much that she keeps going back to her bowl - she is a bit on the gluttonous side. Also it's good to know that about the gelatin, I kind of felt like one of the main ingredients should be 24k gold or black truffle for as much as this stuff costs, lol. I'm not sure why it's so pricey when the Nulo we tried has more meat but costs so much less. And I didn't even see that Tiki cat dry food! I was sifting through all the grain-free options on Chewy last night but I missed that somehow. That one looks awesome and she's already eating their salmon mousse, so maybe she'd like the kibble as well. The Dr. Elsey's costs more because they do not use any sort of vegetable protein (cheaper than real meat) to hike up the protein content of their food. Nulo (peas listed #5 ingredient) is at 42% protein while Dr. Elsey's is at 56% (all animal protein-no peas). It would probably even out in the long run to feed Smo the Dr. Elsey's. Yes, it is more expensive up front, but you feed less because the calorie content is so high (554 cal/cup vs. Nulo's 421 cal/cup). If you free feed, they naturally eat less because it fills them up quicker. You get over 100 calories more AND it's more "bang for your buck" because of the better animal sources of protein I listed above. As for the cost because yes, it is pricey!...Chewy occasionally has it on sale for 30% off. If you join the Dr. Elsey's email club, they send out coupons as well. Other online retailers sell the dry as well. You've already seen the positive improvements in Smo (she likes it, glossier coat, healthy poops, etc.). It just takes a little sleuthing to find the good deals. @EmersonandEvie Whoa, I had no idea the protein content was 56%! Thank you for clarifying, I was just going by the ingredients list and I guess I didn't check it over that thoroughly. I'd love to keep feeding her the Cleanprotein but it doesn't seem like she's eating any less of it than her usual kibble - the Cleanprotein's disappearing at about the same rate as her other kibbles used to. With the high protein content I'm also a little concerned about her putting on weight since she keeps chowing down. Right now I'm leaning toward picking up Merrick's Purrfect Bistro, or the salmon Tiki Cat kibble that mizzely mentioned above. Neither are as protein-rich as the Dr Elsey's, but the wet food we feed her (Tiki Cat salmon mousse) is very pricy too and I'd hate to cut that out since she needs the water in it. It's funny, she used to get cat chow in a plastic bowl from her previous owner and since I got her she's turned into a cat gourmet. She has three porcelain bowls of kibble out right now like she's at a cat food tasting, lol. How long has she been eating it? She may just be "used" to eating a certain amount of food and not realize that she is full. momof3b1g, maggiedemi and smosmosmo purraised this. maggiedemi and smosmosmo purraised this. The first four ingredients don’t have to be meat based if the recipe is simple enough. In this case, there’s likely a huge drop-off in volume by weight between the animal proteins and the gelatin or chicken fat. You don’t need another animal ingredient in the top four if the remaining ingredients aren’t plant-based ingredients that dilute the protein quality and digestibility. smosmosmo and mizzely purraised this. Well high protein won't increase weight, but calories will. For most adult, fixed cats they only need 20 to 25 calories per ideal body weight. A 10 lb cat then would only need 1/3 to 1/2 cup of it per day if it's the only food. Do you measure out the food or free feed? It is true that the cost evens out though my cat if fed a purely dry food diet (when he gets dry it's Dr. Elsey's) for a month for my very large 14lb cat per the vets recommendation would get 1/2 a cup of Dr. Elsey's a day with the 6.6lb bag which is equivalent to 2994 and a 1/2 cup of Dr. Elsey's is 67 grams which means that a bag would last him approximately 45 days. So all in all the cost isn't as bad as it seems as it is $43 for a bag. The clean protein does also have a salmon variety which boasts the same quality ingredients, but also the same price tag, but is good if you wanted to try fish. The tiki cat is the next best choice but is price wise the same as the Dr. Elsey's and is slightly higher in carbs. Dr. Elsey's is 8% and tiki cat is 12%. Correct, calories are not equal but eating more calories than the body can use still results in excess energy being stored as fat. Protein takes longer to digest than carbs do too which helps the body naturally consume less because it feels fuller longer. Hmm, I've been comparing Dr Elsey's to the other foods I've been considering plus the ones she's eaten before, and while it's slightly higher calorie it's nothing that significant. And I'm just eyeballing it but I do think she's eating probably the same amount of kibble as before - maybe it seems like more because this stuff is costly lol. She does free feed, so I could start measuring out portions instead. I like to spoil her but don't want her getting fat and developing health issues from that. I think I may see if she'll eat the Tiki Cat kibble because it's so well priced compared to Cleanprotein, but I just noticed that Dr Elsey's has a 20% off code on their site for new customers. The Cleanprotein kibble's out of stock at the moment but now I'm really leaning toward getting her the jumbo pack when they restock. It's a big lump cost but I think it should even out over time. maggiedemi, laureen227, EmersonandEvie and 1 other person purraised this. Just wanted to do a short update and thank @mizzely again for the Tiki Cat recommendation. I was originally planning on purchasing Cleanprotein in bulk when it came back in stock, but got some Tiki Cat to try in the meantime. Turns out, Smo LOVES it and is doing really, really well on it. She actually seems to be doing better on the Tiki Cat than Cleanprotein for some reason - her fur is really soft and glossy despite it being shedding season and her bowel movements are healthy and regular, even moreso than on Cleanprotein. The only gripe I have is that she likes it so much I have to mix her old food in with the Tiki Cat so she doesn't get fat, lol. For anyone looking for a good, clean high-protein dry food, I'd definitely recommend. Rosepud, EmersonandEvie and mizzely purraised this.